I (Martin) am not someone predisposed to the flashy player—the one who hits the big shots, grunts the loudest, or likes to rile up the fans with big pronouncements and faux outrage. I prefer the quiet professional, the guy who over the course of the years puts in solid (even brilliant) performance after solid (even brilliant) performance for the good of the team and the game. 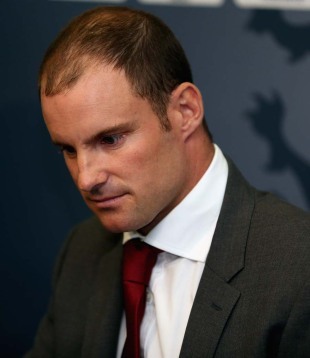 Thus, it’s with some sadness that I (along with all of English cricket) say goodbye to Andrew Strauss, who retired today from all forms of the professional game at the age of 35, having been England captain since 2009 and opening the batting for the side since 2003. He’d just completed his 100th Test match and felt it was time. From all that has been said and written about him by those who know him much better than I, Strauss was clearly a decent, even-tempered man who came into the captaincy at a time when the side was rocked by a falling out between the then-coach and the then-captain, Kevin Pietersen. It’s surely not a coincidence that Strauss leaves the position when Kevin Pietersen—as flamboyant and “big” a player as you’re likely to find in any sport—is rocking the equilibrium of the England team again. Strauss said that the Pietersen affair had nothing to do with his departure, and he’s honest (and diplomatic) enough that one can believe him. Strauss’s form and his scores had been tailing off. He knew it was time to go, he said. And go he did. He hands over the captaincy of the team to another quiet man with a similarly moderate temperament: Alastair Cook. It remains to be seen just how he, and the rest of the England cricket establishment, deal with Pietersen. This entry was posted in Cricket, England and tagged Alasta, Andrew Strauss, Kevin Pietersen. Bookmark the permalink.